Antibiotics are a group of medicines that are used to treat infections caused by germs (bacteria and certain parasites). A parasite is a type of germ that needs to live on or in another living being (host). This class of medicines are also sometimes called antibacterials or antimicrobials. Antibiotics are used for a range of other infections caused by bacteria, including urinary tract infections, skin infections and infected wounds. Antibiotics can be taken by mouth as liquids, tablets, or capsules, or they can be given by injection. Usually, people who need to have an antibiotic by injection are in hospital because they have a severe infection. This report is focused on identifying market size for anti-biotic drug. Increasing bacterial infection coupled with increasing investment and R&D activities in the field for antibiotics drugs are some of the major drivers for the growth of the anti-biotic drugs. This report identifies the anti-biotic drugs market size in for the year 2014-2016, and forecast of the same for year 2021. 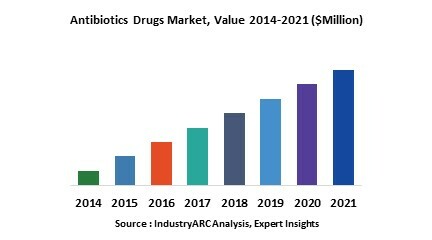 It also highlights the potential growth opportunities in the coming years, while also reviewing the market drivers, restraints, growth indicators, challenges, market dynamics, competitive landscape, and other key aspects with respect to anti-biotic drugs market. Globally North America is the largest market for antibiotic drugs in 2015 followed by Europe and Asia-Pacific as second and third largest regional markets respectively in 2015 for antibiotic drugs. However anti-biotic market in Asia-Pacific region is expected to grow fastest due to increasing demand of anti-biotic drugs in the region due to higher trends of self-medication practices amongst the people for normal health related issues. This is report has been further segmented into major regions, which includes detailed analysis of each region such as North America, Europe, Asia-Pacific (APAC) and Rest of the World (RoW) covering all the major country level markets for anti-biotic drugs in each of the region. 13.7. MERCK & CO. INC.